By Philippa Warr on March 23rd, 2015 at 5:00 pm. ?Death to Taggart, Death to Ragnar, Death to the memory of this treacherous night.? 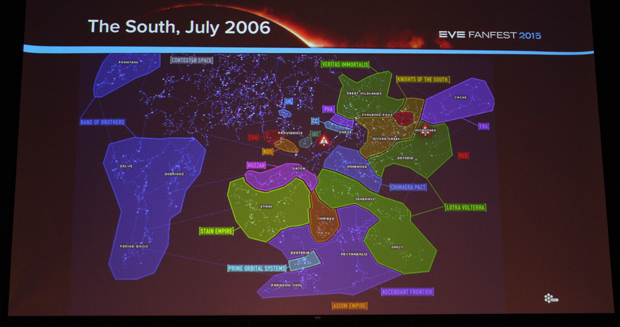 Thus it was that a character named Jade Constantine signed off an EVE Online forum post in 2003. Ragnar was the leader of the rival Taggart Transdimensional corporation and Taggart had declared war on Jade Constantine?s corp. Her overwrought posting ? as role-played by an Englishman ? commemorated the occasion. ?I can?t believe these kinds of characters are just gifted to me on a silver platter,? says Andrew Groen. He?s the journalist writing A History Of The Great Empires Of EVE Online ? an account of the first decade of politics, warfare and culture in CCP?s flagship game. We?re discussing his work in a nook just upstairs from the bustle of EVE?s annual FanFest gathering. The book is nearing completion ? no exact publication date has been set but it should arrive this summer. While at FanFest Groen has also delivered a talk based on some of his research ? it?s called The Most Pivotal Decision In Nullsec History. The focal point of the twenty minute session is a story from 2006. It covers the building of the first ever Titan ship in the game by an industrialist alliance called Ascendant Frontier and how rival alliance, Band of Brothers? determination to destroy it ended up doing another compound faction ? RedSwarm ? a favour, allowing for easier expansion as Ascendant Frontier lost control of their portion of the lawless sectors of game space known as null-sec. Over the course of Groen?s slideshow territories grow or vanish on the null-sec landscape, flamboyant characters deliver theatrical forum post monologues, I learn the first Titan?s name was Steve and a fellow member of the audience chimes in to add that this was in tribute to the recently deceased Steve Irwin. The eventual death of EVE Online?s Steve is a touchy subject for some. CYVOK, former leader of Ascendant Frontier, ended up quitting the game over the issue and, Groen tells me during our interview, is ?not fully over that?. ?It seems that someone told him at some point ? who may have had a decent amount of knowledge but not enough to know what the real story was ? that [Steve] was destroyed under dubious circumstances. Somebody said ?I heard that somebody illegally accessed the server information to find out where your Titan was and then allowed Band of Brothers to get in and destroy it? ? that this person was secretly working for Band of Brothers. So he still thinks that happened. I find it very doubtful ? it?s probably not accurate.? By way of explanation Groen adds ?It?s a huge part of their lives so there?s going to be some bitterness and resentment that your friends didn?t come through or your enemies were a bit too vindictive.? Reading about EVE Online sometimes makes me think of Game of Thrones with its multiple protagonists, complex machinations and its scale. The stories it generates are absorbing human dramas peppered with outrageous characters and they sometimes precipitate seismic shifts in the online community and its division of territory. I could happily read an entire book about them. Lucky, then, that Groen is working on doing precisely that. But what was it that took him from mooching round in an EVE wiki rabbit hole to attempting to document the whole thing in a physical book? It was the wiki entry for The Great War. ?I remember feeling like I?d stepped on a small iceberg that didn?t move and realising this was just the tip. [You think] ?Okay, maybe that?s a bit of an over-the-top name,? then you realise The Great War lasted two years and was an unbelievably bitter conflict between cultural ideologues. It?s not one story. It can?t be distilled down into one story. That woke me up to the fact that this is a grand narrative with all these different characters who show up year after year.? I want to know more about the process of extracting anything approaching truth from a mixture of archived posts, unreliable wiki information and interviews conducted years after the fact, but I also want the hear another story. We go with the story first. ?One of my favourite stories is known nowadays as the F-ET1T Honeypot,? says Groen. ?The situation is that RedSwarm [a federation of alliances including Red Alliance and Goonswarm] is about to invade Band of Brothers and they want to do what?s called a headshot. They?ll go in and take out the capital system. It has this really bad morale effect because it shows the rest of the galaxy that [the aggressor] can come in and take over their home system. You can destroy what should be their most defensible position. Usually morale crumbles and people fall apart if you pull off a headshot. ?So Goonswarm ? specifically the Goonswarm Intelligence Agency ? has discovered a Titan is being built in the capital ship assembly arrays inside the capital system of Band of Brothers.? I interrupt to ask about Titans. ?When I talked about Steve ? the first one ever built ? that was an effort that took three months. It involved thousands of people who didn?t really know what they were working on, like a little Manhattan project kind of thing ? really neat story. It takes about three months and ? do you play Civilization? You know when you?re doing the science victory and you?re assembling the rocket to go to Alpha Centauri and you have to build the engines in one part and the cockpit in another and bring them all together? Building a Titan is a lot like that. There?s something like 17 components that go into that and each one is this weeks-long thing you have to assemble and build in factories. It?s a complex process and there?s a lot of excel spreadsheets involved in keeping track of all of it so you don?t just lose the doomsday cannon somewhere.? ?So Goonswarm has discovered Band of Brothers is building a Titan in F-ET1T. The problem is there are two shipyards in F-ET1T and they don?t know which one it is so their plan is to go there and see what happens. They amass this enormous fleet ? unbelievable amounts of fire power. This is a grand war party marching because they?ve rallied all these people round the idea that ?We?re going to crush Band of Brothers ? you?ve been under the heel of their boot culturally and physically in this virtual space for years now ? we?re going to crush them and embarrass them.? ?They march their war party across the galaxy and show up at F-ET1T. SirMolle [the leader of Band of Brothers] has set up all of his defence around the empty shipyard and [GoonSwarm] have no idea that there?s another shipyard building the Titan way out in the distance. RedSwarm brings their whole fleet over and set up their Dreadnaughts. The dreadnaughts go into what?s called siege mode and these huge artillery guns come out. They?re unloading an unholy amount of firepower on the empty ship yard and Band of Brothers is trying to repair the shipyard. It doesn?t work, it goes up in flames and RedSwarm are like ?YEEEEEEEAHHHHH!? ?Band of Brothers then sends in its logistics fleet to do what?s called tackling that prevents the dreadnaughts from moving and they take out forty of the dreadnaughts. The rest of the fleet retreats and they?re popping them like fireworks but Goonswarm thinks ?Whatever. We killed their Titan and it?s worth so much more than 40 dreadnaughts.? ?It?s March 31st at the time and SirMolle waits til April 1 and goes, ?You guys got us. You destroyed our titan. Everything went exactly as you planned.? ?Then he shows up on April 2 ? ?April Fools! You got nothing. You got this empty husk of a shipyard.’? These stories coalesce as Groen taps a variety of resources. There?s a LOT of digging through forum archives to try and piece together a timeline and flavour of the game at those points. But he?s also been contacting players who were active during those periods to get their version of events. CCP are not involved with the production of the book but they have assisted Groen in the latter, acting as an intermediary as he tries to get in touch with people who played a videogame 12 years ago under a pseudonym. Given the issue of conflicting accounts, selective memory and the potential desire for players to self-mythologise I ask whether there are any periods of the history which simply don?t sit right with Groen or which he doesn?t feel he?s got to the nub of yet. ?Honestly? Every period of its history is probably like that. It would be complete arrogance of me to say this is the authoritative history of EVE ? I nailed it, it?s 100% right, I got nothing wrong! That?s not to say I?m not confident in my reporting because I take accuracy very seriously and I get back in touch with everyone I?ve interviewed and fact check, but it?s still limited to the sources I?ve been able to find. ?There?s parts of the book I had to ultimately cut because the information isn?t there. The international aspect of EVE plays havoc with someone who only speaks English. If you can imagine what it?s like trying to create a timeline of information based only on interpersonal interactions with Germans in 2004 or, even worse, when it?s a war between Germans and Russians. These are things I think even World War I historians struggle with because we don?t have perfect exchange of information. ?There?s a period between 2003-2004 in the south of null-sec at the time that was almost entirely European and Russian and I?m not satisfied with how much I know about that so I had to cut it.? Serenity, the Chinese server, is also absent from the book. ?I talked about how hard it is [for me] to learn about the German and Russian communities ? the Chinese community is the ultimate extension of that. Not only do they speak another language, they use another alphabet, they?re behind the great firewall and they live in an entirely separate [EVE] universe ? the two don?t overlap. In my dream scenario I?d like to find a badass Chinese journalist who can do the same thing for the Chinese server.? In terms of the actual interviews, it took a while for players to open up to Groen and to understand what he was trying to achieve with the project. ?It took a few good interviews with people so they could go to their friends and say ?This guy?s legit?. In some cases people needed to be shown what I was writing before they would panic and realised their enemies would be the ones telling the story if they didn?t get involved.? The book is nearing completion but the EVE universe is a living space and the spaceship scuffles continue apace. With no real end to the player behaviour we move on to the problem of where you end the stories in the book. It?s something Groen tells me he?s been thinking about for ten months. ?What I?ve decided is that I can frame the book so that even though the historical research and stories go on past this, the book itself is framed as the story of The Great War. That?s a story that starts from 2002 in beta and it?s fascinating to watch the incredibly elaborate domino effect that leads into that.? It sounds like the end point is also partially dictated by the events players are willing to discuss openly. ?There?s this factor you start running into at the end of 2011 where people start not wanting to tell you things,? says Groen. ?It?s more real and things that happened in 2012 matter to what?s happening right now.? Combine that with the fact that the fallout from more recent events won?t be fully established yet and you realise that the most recent years of EVE Online don?t offer that same opportunity for analysis and the bigger picture as The Great War. During his talk, Groen mentions the flood of uncategorised archive information he?s picking through, the changeable wikis, the forum posts. As we talk in the interview he mentions the fear of information not exactly disappearing but simply becoming unreachable when the amount of digital content we produce outstrips our ability to catalogue it for archive accessibility. He also tells me that we don?t necessarily understand the importance of virtual worlds right now and their potential impact on the future. His book is an attempt to make something coherent from all of those disparate strands and smatterings of information. ?We?re all working in real time to try and parse the unbelievable flood of information coming at us and I think a book is a tremendous way to do that, to take it offline and and make sure it?s not part of that information flood. One of my greatest hopes is that we?ll be able to get it into a museum.? But even as Groen is attempting to extract EVE?s stories from this multiplicity of information and despite the fact that the end of the project is in sight, he points out publication may well trigger another flood of information. ?That?s when everyone?s going to come out of the woodwork. That?s a wonderful thing and if that happens I will have done something right because people will have realised the importance of this and the value of these stories, what it means and the value to the community.? ?I?m unfollowing you, get back in the kitchen, why are you interested in local politics? ?